Ride through the legendary ports of the Costa Blanca discovering the fusion between the sea and the mountain of Alicante, accompanied by professional cyclists and in a group with your same physical level, always surrounded by the sun and the Mediterranean Sea. ¿Can you imagine? Discover our I CYCLING CAMPUS by Omar Fraile, a new concept of stage for road bike lovers. Three days of pure cycling in Benidorm’s October, where the good weather that characterizes the area is assured. Enjoy riding uphill with us through the mythical Coll de Rates or Tudons Aitana, some of the highlighted ports from past editions of our annual multi-stage bicycle race “Vuelta a España”. We will rest very close to the beach, within the comfort of a 4 stars hotel like the “Hotel Carlos I” of Benidorm, a hotel with all the luxury of details that won’t leave you indifferent. 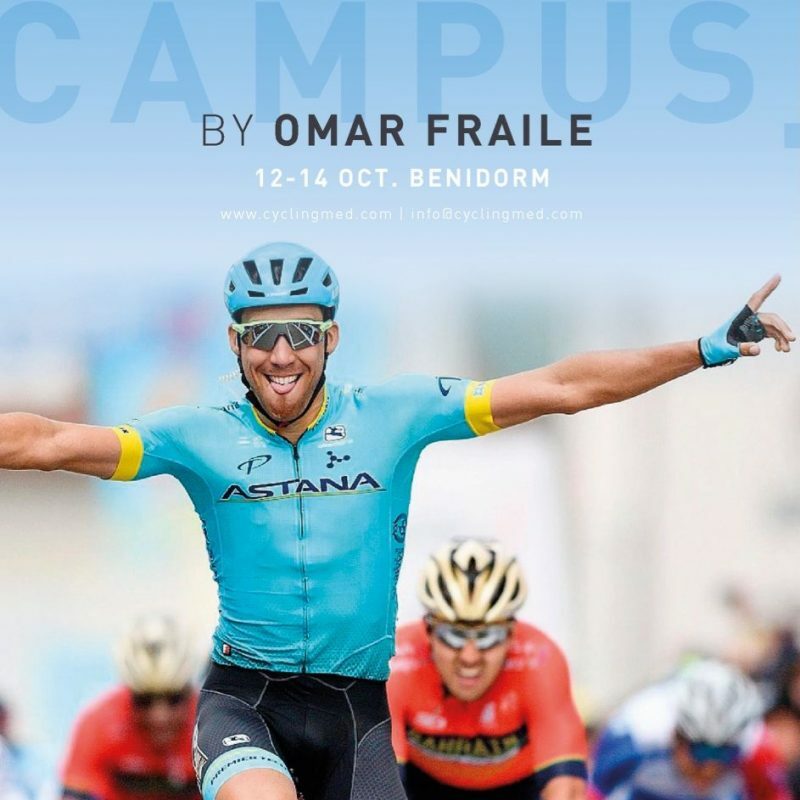 Additionally, not only are we going to ride our bicycles, we will also be accompanied by cyclists like Omar Fraile, active cyclist ProTour in the Team Astana. We will enjoy his company during the three days of the Campus, with organised talks and round tables with the best experienced nutritionists, biomechanics or coaches from who we will try to learn as much as possible… are you still thinking about it? We have combined our experience of years and the value of the knowledge of a Pro Tour cyclist as Omar Fraile, active cyclist in TEAM ASTANA. Omar will delight us with his experience, accompanied by other professional and amateur cyclists, teaching us his tricks to roll in plain or enjoy the uphill climbs, always in small groups of your same level with expert guides and escorted by neutral car support fully equipped. You’ll feel like a real pro. A unique Stage premium you can’t miss. And what does it include while cycling? And what does it include while resting? Our base of operations is located in a quiet area of Benidorm, 10 minutes walking from the city center and the famous beach of Poniente. The 4 stars “Hotel Carlos I” is the perfect place to enjoy some deserved days of rest and biking in the heart of the Costa Blanca.